Spend the morning at our Cookery School and leave calm, cool and collected with your Christmas goodies in tow at the end of the class. 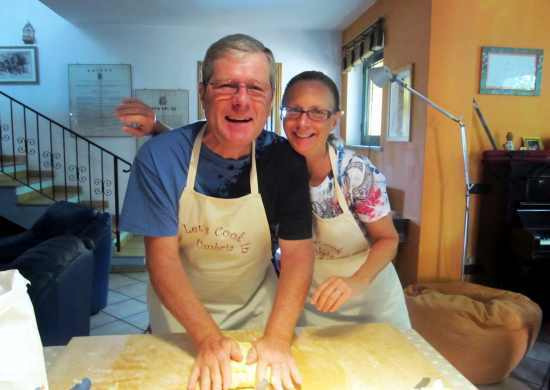 The cooking class includes four courses from the Christmas in Italy menu. At the end of the cooking you will sit down for a fabulous lunch with Christmas recipes and celebrate with a glass of our organic wine. 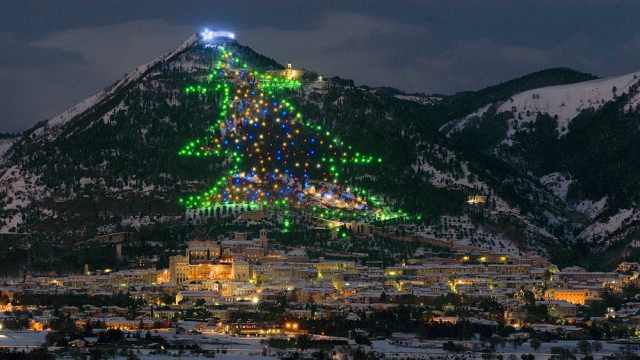 This will be followed by a very special Christmas tour: Gubbio and the highest Christmas tree of the world. Gubbio is the oldest town in Umbria region, as shown by the Tables of Gubbio, housed in the City Museum, and the Roman Theatre’s ruins. It is a medieval town, rich in historical and artistic heritage as well as in ancient traditions, that can be found intact in its folklore and products. A walk through its alleys is like going back in time. From 7th December 2017 to 10th January 2018 in Gubbio you can see the Gubbio Christmas Tree, the biggest Christmas Tree in the world. The Tree is over 650-meters high, with more than 250 green points of light, about 300 multicolored lights and a star of 1.000 m² on top of the tree, designed by 200 lights. Such an achievement could not be unnoticed, and in 1991 it entered in the Guinness Book of World Records as “The World’s Largest Christmas Tree”.